The Dance Dance Revolution Senyou Controller (ダンスダンスレボリューション 専用コントローラ), released in 2000, is a special dance mat controller that can be hooked up to the Sega Dreamcast system. It is primarily used to recreate the arcade experience of the Dance Dance Revolution series, fronted by Konami in the arcades. Two games use the Dance Dance Revolution controller; Dance Dance Revolution 2nd Mix Dreamcast Edition and Dance Dance Revolution Club Version Dreamcast Edition, both of which, like the accessory, were only released in Japan. The controller comes in two varieties; a standard soft mat, bundled with games and has a tendency to move or shift during game play (as well as wearing out quite quickly), and a much more durable foam mat, which prevents moving during gameplay. The latter was sold separately. 4 Arrow Buttons: These simulate the , , and movements in the game and allows you to scroll through the games options. 1 Button: This acts as the B Button on a normal Dreamcast Controller and cancels or goes back to previous options. 1 Button: This acts as the A Button on a normal Dreamcast Controller and confirms or advances any options. 1 Button: This acts as the Start Button on a normal Dreamcast Controller, which of course starts the game. 1 Konami Button: This button allows the user/player access to a hidden options menu in the Music Select screen. The Dreamcast DDR Controller can also fold up for use on the go. A standard Dreamcast controller can be used in conjunction with these games to edit the step charts of any song. 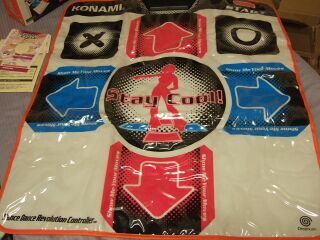 It can also be used instead of a DDR controller, though obviously this removes the "dancing" aspect unless you use your feet to control the standard controller, which isn't recommended for obvious reasons.